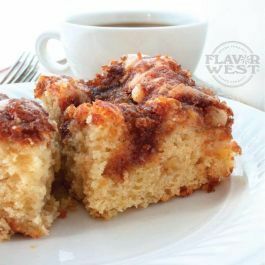 This is delicious coffee cake dessert flavor that contacts the taste buds with its profound, rich, sincere and creamy flavor taste. Add a drop of coffee cake flavor and feel the aromatic smell. Type: Coffee Cake Water Soluble Flavoring. Ingredients: Natural and Artificial Flavoring, Propylene Glycol. USP Kosher Grade Flavoring. Usage Rate: 15-20% for E-use. Flavor suitability: beverages, desserts, drinks, candies, caramel, baking recipe and more. Specific Gravity: 1.05 No Refunds on Flavoring.